carved back, double sided, radial bracing, cedar soundboard, mun ebony sides and back. Creator Description: I like the Hannabach 815 trebles because of their very clear and balanced tone, easy tuning, good response to vibrato and color changes, as well as endurance against scratching. They also project very well, while still providing clear and round tone. I prefer the Savarez Cantiga basses because of their power and projection. They add a deep and heavy quality to the basses, remain very clear, and project really well. 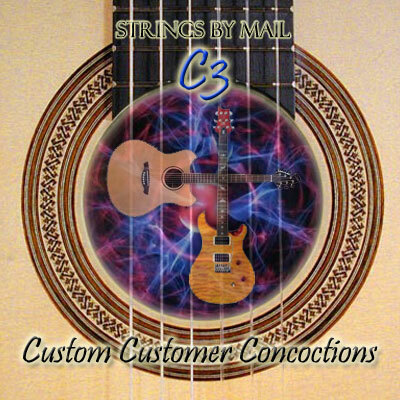 These strings together make my guitar sound very balanced, clean, warm and powerful at the same time. This is a new combination for me. I have always loved the Cantiga basses, but the Hannabach's trebles were a really nice surprise to me from the first try and I have now permanently switched to them. I love the strings chosen by Gohar. They are medium tension, which I prefer, but the best thing I like is the sound of these strings. I’ve tried other custom sets from Strings by Mail, but this is the set I will keep using, until something even better might pop up. I always liked Savarez Cantiga strings but I found the New Cristal trebles to be a bit bright and slightly thin and therefore hard to hold on to. Gohar Vardanyan has found a great pairing with the Cantiga basses I love and darker, easier to control trebles from Hannabach. These strings give my guitar a warm, full sound. I have a custom Johnny Walker Grand Concert, AAA European Spruce top, coco-bolo sides and back that Johnny built for me awhile back. Simultaneously I have owned and played several other custom-built guitars by other notable makers. The JW has flawless workmanship, (something I cannot say about all others) and yet, while at times parts of it sings with clarity in the trebles and occasional grit in the basses the projection of the mid-range could be better. Having a selection of partial string sets from over the years I selected this exact combination of strings from my left overs and: viola! And, ye hah! Sustain: check, Projection: check, Clarity: check, Clear pretty trebles: check, Gritty Basses: check, Clear and well projected mid-range: check. I guess my point is: when you believe you have the right instrument for what you envision it may just be a unique combination of strings to make it sing. I sure am happy that this string collection is a set.